ESRT is a non-profit, 501(3)c organization that depends on sponsors to educate and train local students and present professional-quality theatre experiences in our community. Help us continue to inspire Mobile and Baldwin county students through performances, summer camps, workshops and more! ESRT is a Section 501c3 non-profit organization. Your charitable contributions may be tax deductible for federal income tax purposes. 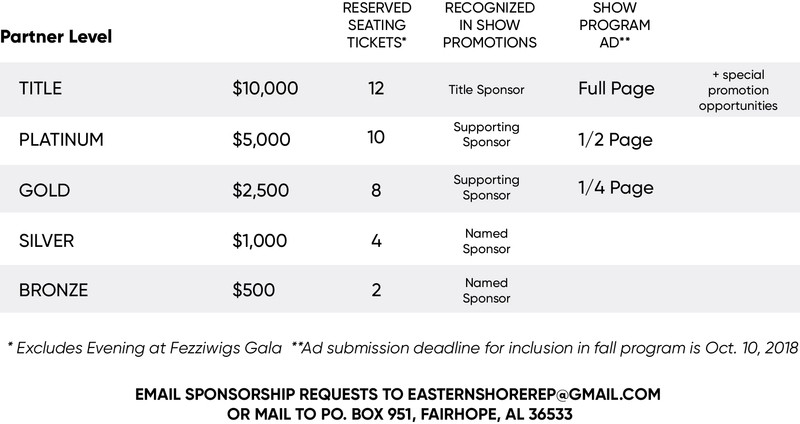 ESRT offers several sponsorship levels with a variety of benefit packages for our sponsors, including advertising options, recognition on the ESRT website and in ESRT publications and other event materials, and VIP show tickets which include reserved preferred seating and an exclusive invitation to the Opening Night Sponsor Reception at Theatre On the Bluff. A summary of each sponsorship level can be found below. For more information about sponsoring ESRT, email easternshorerep@gmail.com. Thank you to last season's sponsors!